They are made from the same material as roof tiles and fired for finishing. 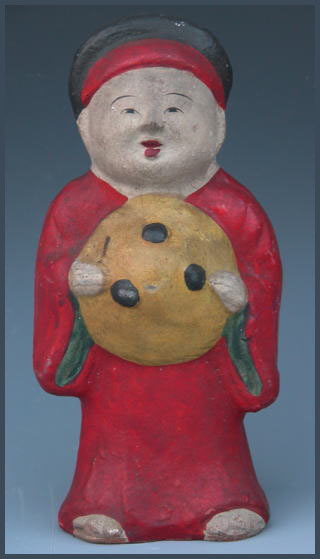 The most famous are the Fushimi clay dolls 伏見人 from Kyoto.
. Fushimi Clay Dolls 伏見土人形 . Imado is located close to Asakusa in Tokyo. 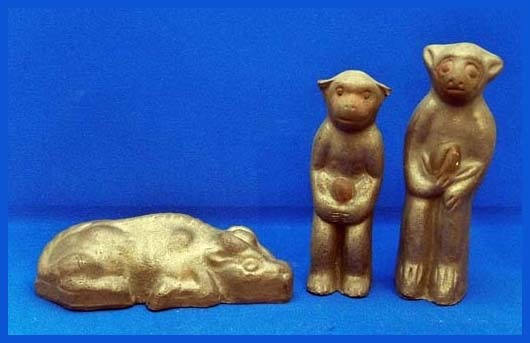 The clay was taken from the river Sumidagawa to produce cheap toys for the children of Edo. The last craftsman to produce these dolls was Owariya Harukichi 尾張屋 春吉 who died in 1944.
is a Japanese shrine located in Imado where north part of Tokyo Asakusa. It is one of the Shichifukujin (七福神) Shines of Asakusa, and enshrined Fukurokuju (福禄寿). The history of the shrine begins at 1063 by Yoshitomo Minamoto and Yoshiie Minamoto. It is very famous for the birth place of fortune cat (招き猫, manekineko), and last place of Soji Okita (沖田総司), the greatest samurai warrior of Shinsengumi (新撰組). Now, it is well known as good luck shrine for love and marriage. This shrine is also known as the last place of Soji Okita who is one of the most popular and strongest Sumurai in the Edo period. He was the team leader of 1st party of Shinsengumi. When he was suffering from tuberculosis, he was curing at this temple. However, he died because of that. It was great irony that the greatest samurai who never lost by sword fighting could never get over with his disease. Emperor Ojin, Izanaginomikoto, Izanaminomikoto and Fukurokuju. Pray for: Good luck for love and marriage (enmusubi). beckoning cat for a good match from Imado shrine .
. tookooshi 陶工師 Tokoshi, potters in Edo .
. Hashiba 橋場 Hashiba district, "place with a bridge" and Imado . They have a tradition of more than 400 years. 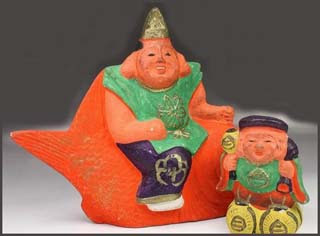 The Koga ningyo doll, along with the Fushimi ningyo doll of Kyoto and Tsutsumi ningyo doll of Sendai, is considered one of the three finest Japanese fire clay dolls. 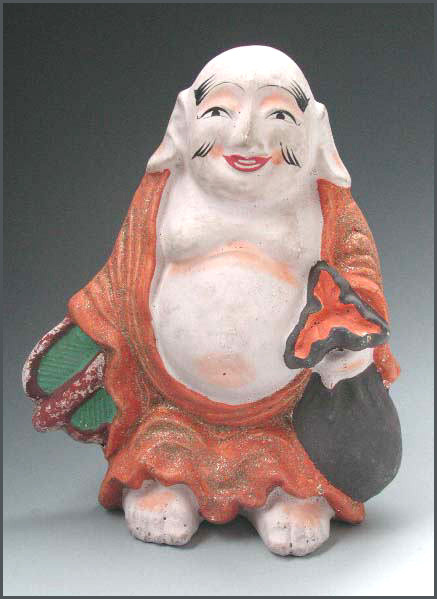 The Koga ningyo doll has ancient origins, and some believe it was made during the Genroku period in the Edo era. 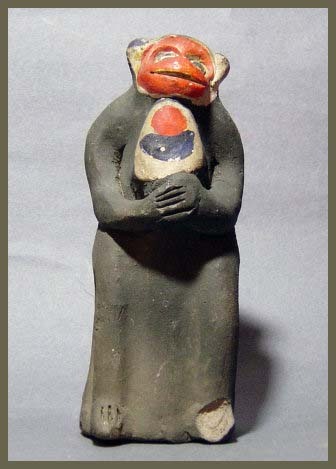 Several hundred such dolls existed in the old days, but today only about half remain due to breakage, weathering, and neglect from years of lack of use. 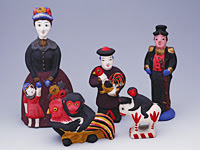 These dolls feature bold colors and the rich expressions of animal faces; however, today one can see only familiar dolls such as a Western woman with a child, a Dutch doll with a gun, and a Chinese doll holding a chicken. These dolls are plentiful and create the exotic atmosphere of Nagasaki. Nagasaki is an exotic and a romantic city. . . . The first Europeans to arrive in Nagasaki were the Portuguese, who brought in their colorful culture. But with the oppression of Christianity, the effect of this culture soon died out. Soon the Dutch Trade Mission in Hirato moved to Nagasaki and the Dutch culture grew to full bloom. But it was the Chinese who left the most effect on Nagasaki culture, since they were also there when the Portuguese and Dutch were there. 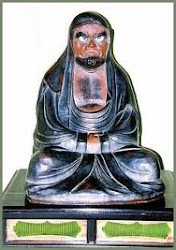 The people of Nagasaki called them Acha-san as a sign of affiiliation. Koga dolls include a lot of animals. Some combinations of animals are not seen in other regions. Like a monkey embracing a chicken (rooster) or riding on a monkey. 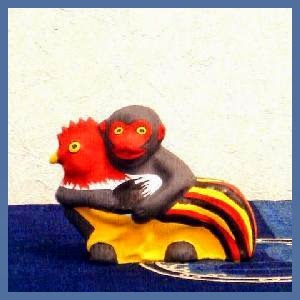 The monkey is an auspicious animals (saru 去る to make bad luck go away). 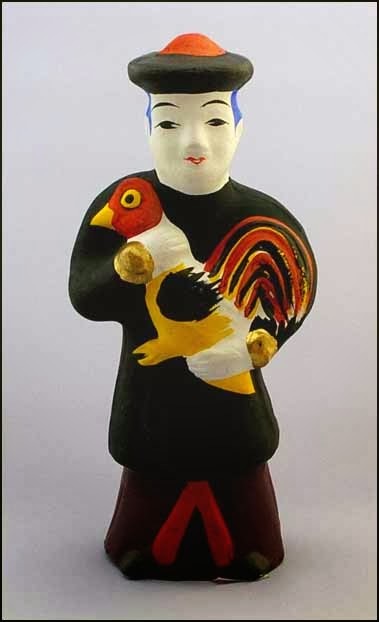 torisaru　鶏猿 - 取り去る to go away (of bad luck) is especially auspicious.
. O-kage mairi お陰参り "Thanks pilgrimage" .
. Wakayama Folk Art - 和歌山県 . 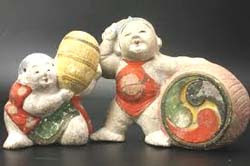 They are a amulet for easy birth (安産の祈願 anzan).
. Folk Toys from Yamagata.
. Kawara　瓦　roof tiles . Ebisu, Daikoku . . .